An important topic today with end-use customers using aerosol cleaners, is the changing regulations regarding the VOC content and compliance of solvent-based products. Many customers are perplexed as to why manufacturers and suppliers don't already have this information on their product MSDS (GHS safety data sheets) and tech data sheets. At one time, the weight percent of all non-exempt chemicals in most products was listed on each product MSDS, but this information has been removed for several reasons. And, as most everyone knows, the regs are changing all the time. There is an evolving Federal list of exempt chemicals along with many state and municipal lists of currently exempt chemicals. In some instances, these lists do not always agree. Additionally, there exists at least three EPA-approved ways to calculate VOC content. And, each method can yield different values for the same product. The choice of a particular calculation method can depend on the customer's location and the air quality regulations for their particular region. It's important to review what a VOC is and why it's important. VOC stands for "volatile organic compound." These are chemicals whose vapors have been found to chemically react with nitrogen oxides (NOx, which are produced by auto exhaust, the burning of fossil fuels for power generation, and other industrial processes) in the air and in the presence of sunlight to produce ground-level ozone or "smog". The ability of certain chemical vapors to produce smog when sunlight makes them react with nitrogen oxides is referred to as photochemical reactivity. The direct emission of these vapors into the air defines the scope with which the EPA is most concerned. Thus, chemicals whose vapors are not photochemically reactive to form smog are considered exempt and are not included in the process of determining the amount of VOC ingredients in a particular product. The federal EPA publishes a list of exempt chemicals and many states also publish their own list. A chemical that is listed as exempt on the EPA list may not appear on the individual state or municipality listings. A basic Internet search for methods of calculating VOC will generate literally 1000s of information sources and reference sites. VOC test results are used for a variety of purposes. These are predominantly for emissions fees, new source review applicability, and compliance with permit limits. Most VOC and air quality/emissions permits do not specify VOC test methodology for purposes of demonstrating compliance with VOC limits. Currently, there are inconsistencies and a lack of guidance among states and EPA regions in implementation of VOC test methodology. It is technically difficult to specify any one single method for VOC measurement. This is why it is difficult to specify a simple value for the VOC content of most cleaning products. Without specific knowledge of the area of the country in which the customer is located, the EPA region under whose regulations they operate, if they are operating under a Federal NESHAP, the existence of state and local emission regulations, and the specific application or way in which the product will be used, it is difficult-to-impossible to list accurate and specific VOC information on a product MSDS. Many states do not recognize all of the chemicals on the EPA lists as being exempt. Formal exemption of a chemical from VOC consideration may depend on how it is being used. California is generally the most extreme case and most industry there is moving toward water-based cleaning. So, why are VOC determinations mission-critical today? 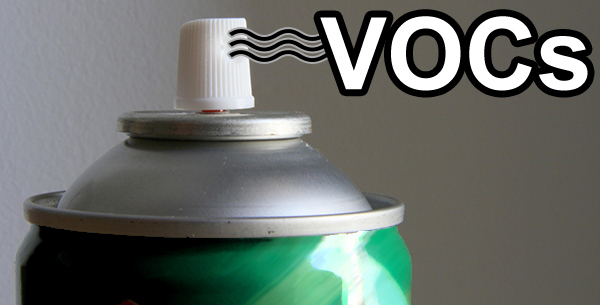 Traditionally, VOCs have been used for conformal coating and various contact cleaning and flux removal applications. The properties of a conformal coating stem from the selected base resin and the various additives, while the solvents used in most cleaners come from an aromatic or aliphatic hydrocarbon base. These are included to optimize the performance of the cured coating or the formulated cleaner. Organic solvents are used to dissolve the base resin and reduce viscosity to bring the coating within a workable range. As such, the conformal coating dries by a simple solvent evaporation. Contact cleaners and flux removers function in the same manner. Cleaning is an essential process required at different stages in PCB manufacturing. The purpose of cleaning is to ensure good surface resistance and prevent current leakages which lead to PCB failure. Future markets see electronics getting smaller and smaller, and the requirement for high performance and reliability is stronger than ever. Many manufacturers are turning to "no-clean" processes implying that cleaning is not required after soldering. In the "no-clean" process, rosin and activator are not removed prior to the next process such as coating or encapsulating of the PCB. Such residues, along with any other unwanted elements collected due to the missing cleaning stage, could cause issues with adhesion and possibly affect the performance of the protecting media applied. It can therefore be stated that even with advances in new technologies, such as "no-clean" fluxes, cleaning is still an essential multi-stage process within the electronics industry. Finally, there are also cleaning stages required for the removal of coatings and adhesives when re-work is necessary and for the cleaning of actual components and for maintenance of the production line. Volatile organic compounds in cleaning and coating chemistries will continue to be a point of concern at the end-user level. Low VOC alternatives are available as are water-based options. Every manufacturer must maintain awareness of changing VOC regs and formulate products which are in the best interest of the environment, the industry, and most importantly, the end-use customer. ACL Staticide is committed to this effort as we develop and commercialize industry responsible and compliant new products. Q Source would like to, once again, thank our guest blogger, Steve Allen. We appreciate your contributions to The Q Source Resource and look forward to sharing your future articles, as well. For information about ACL Staticide products, please visit the ACL Staticide Department at QSource.com. You may also contact us via email or phone at 800-966-6020. There are three steps to getting your FREE accessory: Purchase your Weller station at QSource.com (by tomorrow--the invoice must be dated between Feb. 3 and April 30, 2014), download the redemption form (indicate on the form one accessory for each station purchased), and email or fax your completed form to Weller-NA@Weller-Tools.com or 919.387.2639 (WITH a copy of your distributor sales invoice). Redemptions must be postmarked within 30 days of the distributor invoice date. For questions and additional information please contact us via phone (800-966-6020) or email. 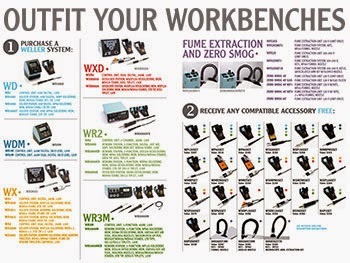 You can also refer to our previous “Outfit Your Workbench” blog article for further details. In an Earth Day announcement, 3M revealed yesterday that they have earned a privilege that no other industrial company in the world has attained. For the 10th year in a row, the United States Environmental Protection Agency (EPA) has presented 3M with the EPA ENERGY STAR® Sustained Excellence Award. Recognizing the importance of energy efficiency and environmental concerns as a strategy for corporate social responsibility, 3M stated that they've worked the past 10 years (and longer) to improve their processes, raw materials, and efficient methods for resource savings. Among 3M's sustainable products are 3M Novec Engineered Fluids, 3M Window Films, and 3M LED Advanced Lighting. 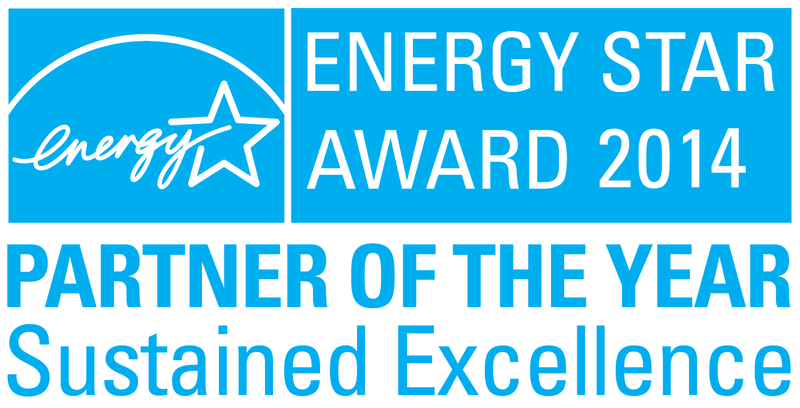 The Sustained Excellence achievement is the EPA's highest ENERGY STAR award. The EPA created ENERGY STAR in 1992 to stimulate corporate efforts to reduce greenhouse gas emissions. 3M is the only company to ever receive the Sustained Excellence award ten years in a row. In related news, 3M received the Xcel Energy 2013 Energy Efficiency Expo Award for saving nearly 1.8 million therms of gas. And in an effort to further solidify their commitment to corporate responsibility, 3M became a member of the United Nations Global Compact, a voluntary initiative that outlines 10 doctrines in the areas of human rights, labor, environment, and anti-corruption. 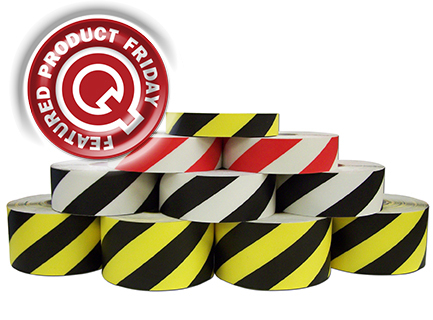 Q Source has been an authorized distributor of 3M products for more than a decade. We congratulate them on their recognition and continued sustainability efforts. Save 23% off the MSRP on the gallon size of ACL Staticide’s 3000G Staticide Concentrate (MFG Part Number: 3000G) when you use our FPF041814 Coupon Code. This Featured Product Friday (FPF) promo is valid from today, April 18, 2014 through Sunday, April 20, 2014. 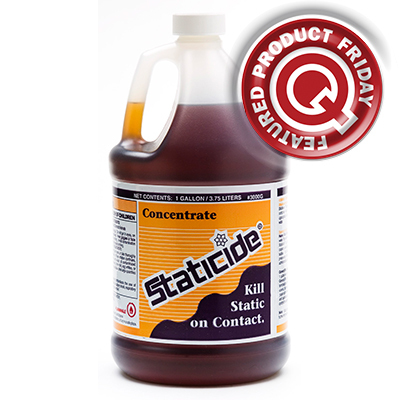 This ACL Staticide 3000G Concentrate (Q Source SKU: A008-000008) is an easy-to-use, topical anti-static solution for use as a long-term static control. On a hard surface, one gallon of Staticide 3000G will cover several thousand square feet and last from weeks to months depending on the application. Regularly listed at $500.00, but with our FPF code savings you’ll get it for just $385.00 (a savings of $115.00). While this is a 3-day limited-time price, the coupon is unlimited. Use the code as many times as you like while it is valid—and please feel free to share the code with your friends & colleagues, too. Please note: This promo is valid only at QSource.com. The Vision Engineering CamZ is a state-of-the-art, handheld, portable digital video inspection magnifier. The CamZ is the perfect tool for mobile inspection and documentation and allows the user to magnify, inspect, or capture images wherever and whenever they want. Check out this Flickr photo set to get a closer look at this very cool handheld digital magnifier. Be sure to visit our Web site to learn more about the Vision Engineering CamZ. Steve Allen, our guest blogger from ACL, returns with this article about cleaning “no-clean” fluxes. Today, nearly half of all printed circuit boards (PCBs) are assembled with no-clean solder paste. The development of no-clean solder paste was initiated to eliminate the need for further post-solder cleaning of circuit boards. Yet, many electronics assemblers are still struggling with the process of adequately and effectively removing no-clean flux materials. No-clean fluxes are now the most popular fluxes to clean in electronics manufacturing. Most manufacturers have designed and dialed in their assembly lines to run no-clean paste. And, they only clean the boards they want to clean, not always the boards they perhaps need to clean. Additionally, the flux residues left behind by no-clean pastes are more difficult to remove from PCBs than other fluxes. Since they are formulated not to be cleaned, the residues from no-clean products can be left on the board in unwanted areas with detrimental effects on the PCB. That creates a cleaning challenge if you need to clean off a residue that was not designed to be removed. No-clean flux and solder residue on the board depends on the amount of solids in the material, the type of gelling agents, and various activators in the flux. The fluxes in most of today's no-clean pastes contain up to 60% solids. The lower the total solids, the fewer residues on the board. No cleans, in theory, contain lower total solids so as not to need removal/cleaning. Following the reflow process, the flux leaves a small amount of residue around the various solder joints. There are several reasons to remove no-clean flux residues from PCBs. Historically, no-clean fluxes were developed as tacky resins, which inherently coated and stuck to all surfaces. The residue would gradually build up on the test pins. Manufacturers began cleaning no-clean fluxes when problems emerged with in-circuit testing. The latest technologies of no cleans are improved and no longer tacky, but still can interfere with signal transmission in most instances. Also, no-clean fluxes can inhibit proper adhesion of conformal coatings. No-clean flux residues can absorb moisture in process. In any further curing processes, the release of any moisture can cause the coating to be separated from the board and incomplete conformal adhesion can occur. This can allow corrosive materials, carbon dust build-up, or moisture to penetrate under the assembly and cause corrosion, signal transmission problems, and component failure. Today, no-clean paste manufacturers are aware that end-users are cleaning no cleans from board surfaces. The type of flux chemistry chosen can have significant impact on the cleaning process. To effectively clean and remove no-clean solder pastes and no-clean flux residues, a polar solvent or a solution of water and saponifier is necessary. Most no-clean pastes require an organic saponifier for effective flux removal, but some can be cleaned with inorganic saponifiers. No-clean fluxes that contain halides leave the most residue and are easier to clean. However, halide-free no-clean fluxes produce less residue, yet are more difficult to remove. In general, no-clean fluxes can be extremely difficult to clean, particularly following any reflow processes, as they can be baked on and tough to remove. It can be vitally important to resolve any issues with no-clean technologies and their subsequent cleaning challenges at the forefront of the device design process especially with high-reliability products such as avionics or medical devices. In applications where cleanliness is critical, it is important to consult cleaning experts like ACL for the most effective, board-safe cleaning technology. For more information about ACL Staticide products and options for flux removal, please visit the ACL Staticide Department at QSource.com. You may also contact us via email or phone at 800-966-6020. Save 30% off the MSRP on the Steinel (34820) HL 1810 S 3-Stage Professional 120V/60Hz Heat Gun (MFG Part Number: 34820) when you use our FPF040414 Coupon Code. This Featured Product Friday (FPF) promo is valid from today, April 4, 2014 through Sunday, April 6, 2014. 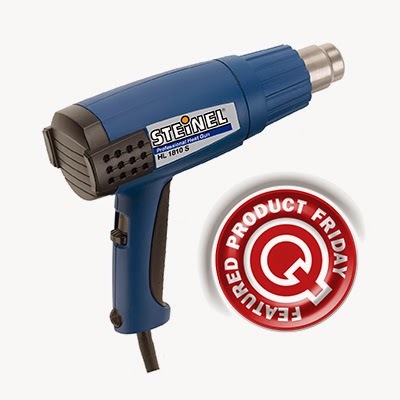 These Steinel HL 1810 S 3-Stage Professional Heat Gun (Q Source SKU: S047-000041) is a multi-purpose heat gun featuring two temperature settings and a cool air stage for convenient hand-held or bench work. The 34820 Heat Gun is perfect for shrink wrapping, activating adhesives, softening compounds, window tinting, bending plastics, and other applications requiring durability and even heat. Regularly listed at $151.40, but with our FPF code savings you’ll get it for just $105.98 (a savings of $45.42). While this is a 3-day limited-time price, the coupon is unlimited. Use the code as many times as you like while it is valid—and please feel free to share the code with your friends & colleagues, too. Please note: This promo is valid only at QSource.com. 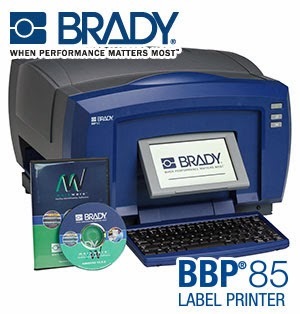 We've always been among the first to tell you about Brady's top-quality label printers. Now we're excited to get to tell you about Brady's "Save Now, Label More" Event. 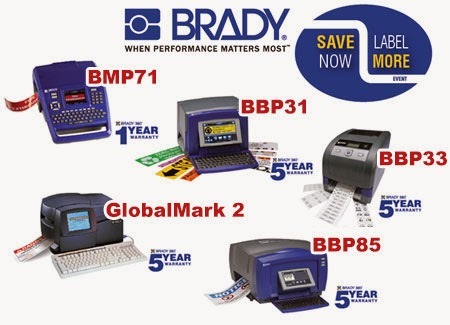 Running through May 30, 2014, you can get 30% off the MSRP of six of Brady's most popular label printers. Material changeovers in just 20 seconds! Automatic label setup with no calibration – prints on the first label! Wire ID, Facility & Safety ID, and Product ID – all in one printer! To place an order for a "Save Now, Label More" eligible printer, please visit QSource.com. For questions, or additional information, contact us via phone (800-966-6020) or email. Offer valid from March 1, 2014 to May 30, 2014. Our year-long 30th Anniversary celebration continues with our exclusive 2nd Quarter Partner Promo. 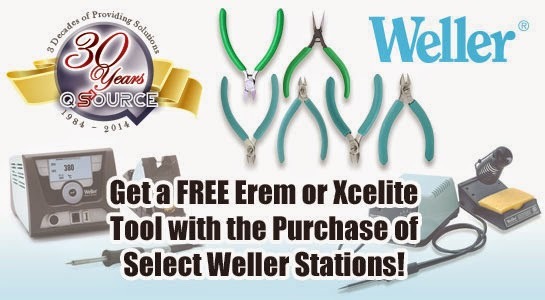 Beginning today, April 1, 2014, get a FREE Erem or Xcelite tool with the purchase of select Weller Soldering, Desoldering, or Rework Stations. Here’s a look at the promo-eligible stations. For more info about any of these please visit QSource.com, our Q Source Resource Blog, or our YouTube Channel. 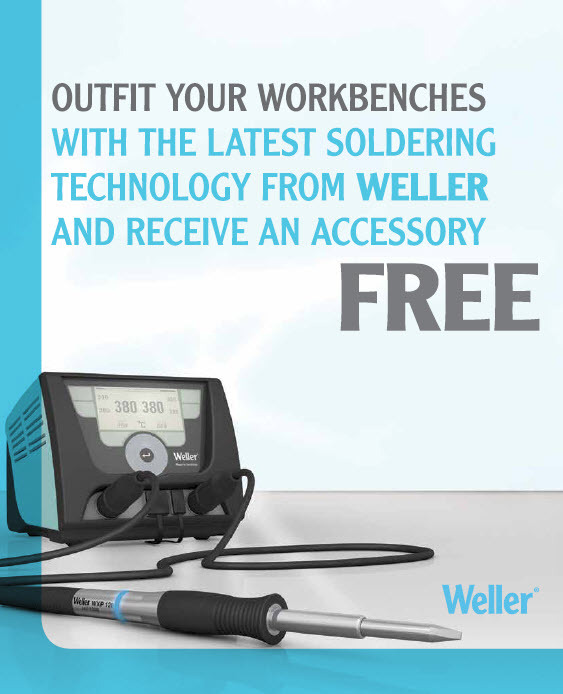 The powerful Weller WESD51 ESD-Safe Digital Soldering Station is designed for continuous production soldering. It features ET Series tips, an innovative heater and sensor, a wireless temperature lockout, and a 90-minute automatic shutoff. The Weller WES51 ESD-Safe Analog Soldering Station is similar in features to the WESD51 model. Designed for a number of applications including production, rework and repair of through hole and SMT boards; and most ground planes and multi-layer boards. The Weller WXD2010 ESD-Safe High-Powered Digital Power Unit w/WXDP120 Desoldering Pencil and WDH70 Stand is compatible with the WXDP120 desoldering pencil. Allows use of one 200-watt WX tool or simultaneous use of two WX 120-watt tools. The Weller WXD2 High-Powered Dual-Port Digital Power Unit allows the user to both solder and desolder using one system. 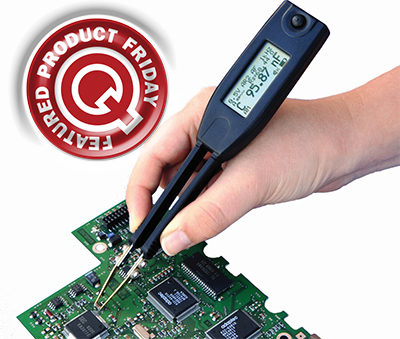 Compatible with the WXMT desoldering tweezers and WXDP 120, WXP 120, WXP 65 & WXMP soldering pencils. 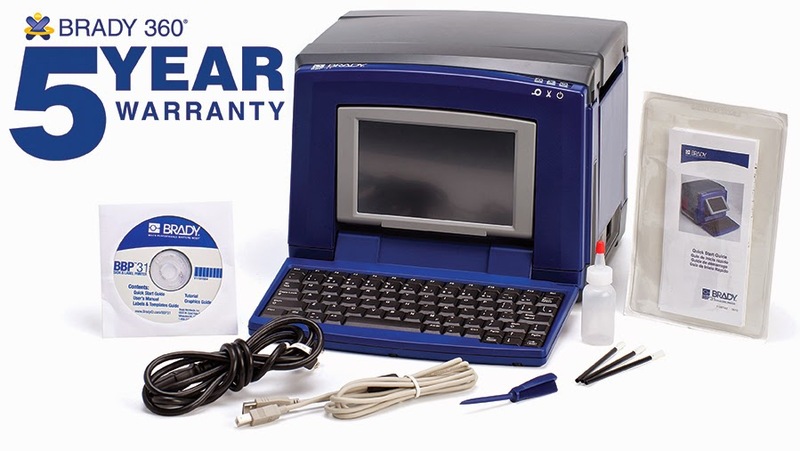 The Weller WX2021 WX2 ESD-Safe Digital Soldering Station w/WXMP-MS Soldering Iron and WXMT-MS Desoldering Iron & Stands is a two-channel station that is easily controlled by a touch-enabled large-graphic LCD display with a turn-and-click selection wheel. The Weller WX2020 WX2 ESD-Safe Digital Soldering Station w/2 WXP120 Soldering Irons & WDH10 Stands is a two-channel station that featuring the same specs as the WX2021, but ships with two WXP120 Soldering Irons and a WDH10 Stand. This station can operate the two 120-watt soldering pencils simultaneously. The WX1012 ESD-Safe Digital Soldering Station w/WXP65 Soldering Iron and WDH10 Stand is a single-channel soldering station that uses up to a 200-watt soldering pencil. This station features an LCD glass touch screen, turn-and-click style wheel, multi-language navigation menu, and a multi-purpose USB port. The Weller WX1011 ESD-Safe Digital Soldering Station w/WXMP-MS Soldering Iron and WDH51 Stand is a single-channel soldering station featuring the same specs as the WX1012 model. The WX1011 differs in the soldering iron and stand included. The Weller WX1010 ESD-Safe WX1 Digital Soldering Station w/WXP120 Soldering Iron and WDH Stand is a single-channel soldering station is similar to the WX1012 and WX1011 in product features. The WX1010 includes a different soldering iron than the other models. 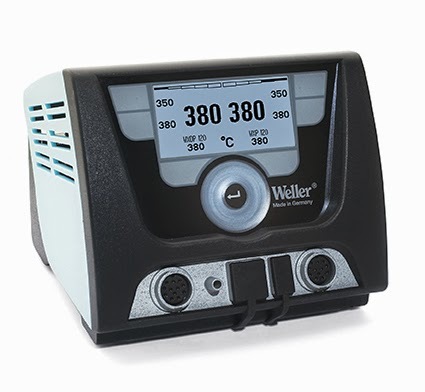 The Weller WX2 WX Series Two-Channel Soldering Station has intelligent power management to help conserve energy and features a large graphic LCD glass touch screen, turn-and-click style wheel, multi-language navigation menu, multi-purpose USB port, and is compatible with the WXP200, WXP120, WXMP soldering pencils, and WXMT desoldering tweezers. 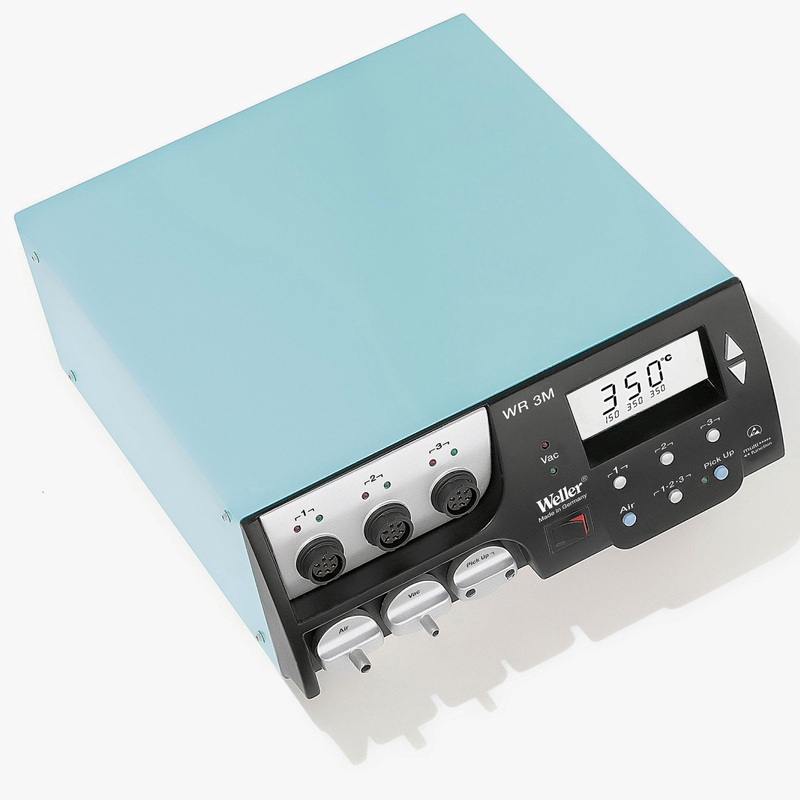 The Weller WX1 WX Series Single-Channel Soldering Station is the single-channel model of the WX2. The WX1 includes all of the parameter configuration, data logging, and connectivity options of the WX2. 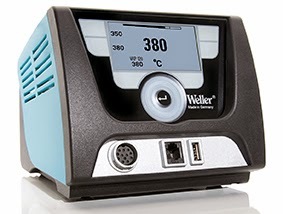 The Weller WD1002 ESD-Safe Digital Soldering Station w/WP80 Pencil features three buttons for pre-setting frequently used temperature settings, a special functions menu for accessing setback, lockout, temperature window, F/C switching, standby, and auto-off time; and a unique silver heater. 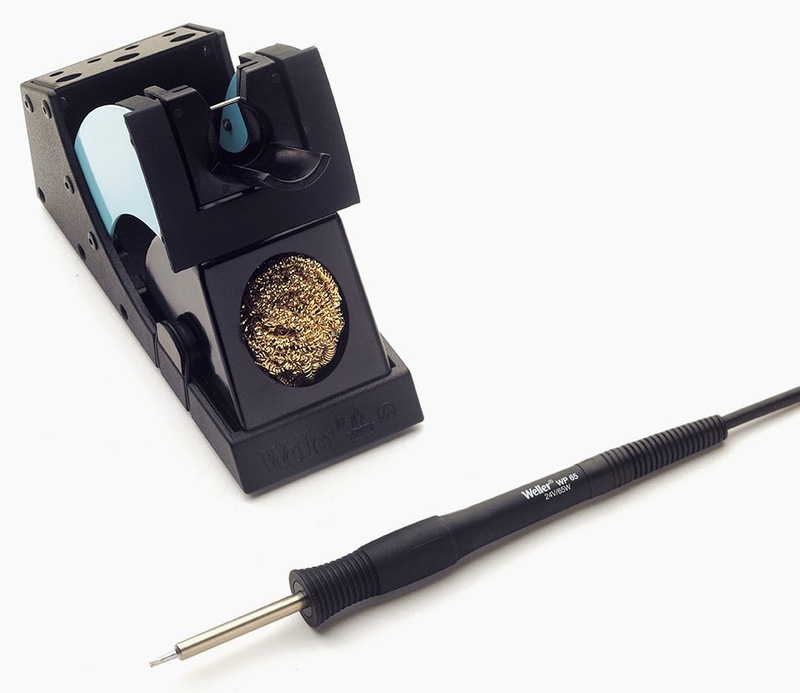 The Weller WD1001 ESD-Safe Digital Soldering Station is similar to the WD1002 model without the WP80 Pencil. 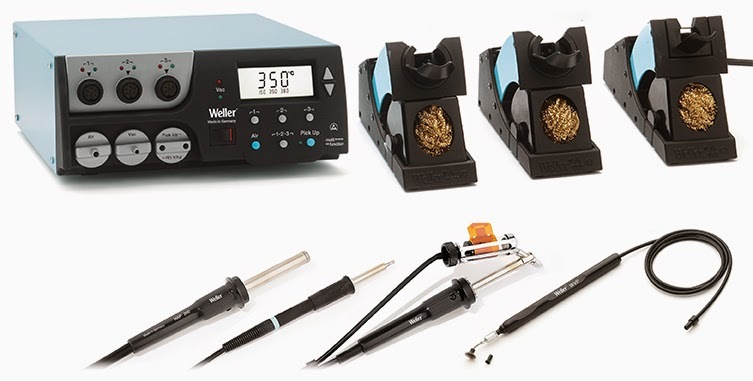 The Weller WD1 ESD-Safe Digital 85W Soldering Station Power Unit features a large, high-contrast LCD display, three pre-set buttons, a special functions menu, and is compatible with the WSP80 and WMP Soldering Pencils. The Weller WR2000ER Digital Self-Contained 2-Channel Rework Station Set w/DSX120 & WP 65 Pencils is a perfect repair kit for soldering and desoldering applications. The WR2000ER kit features a 2-channel power unit with two stands and two tools. The Weller WR3000MER Digital Self-Contained 3-Function Rework Station w/Tools is a large, versatile set for a variety of repair jobs. This power unit includes three stands and three Weller tools. The Weller WR2000VX ESD-Safe Digital Rework Station w/WSP80 Soldering Pencil & DXV80 Desoldering Pencil can operate two tools simultaneously and has a built-in a self-contained vacuum and air turbine. The two independent tool channels feature automatic tool recognition. The Weller WR2000 ESD-Safe Self-Contained Digital 2-Channel Rework Station w/HAP1 Pencil allows for simultaneously use of two tools via two independent tool channels with automatic tool recognition. The unit also features a self-contained vacuum and air turbine with a programmable temperature memory key. The Weller WD2M ESD-Safe Micro Digital Rework Power Unit w/Dual Channels is designed for fine-pitch, high-density SMT soldering and rework. The WD2M also allows the user to use the WMRS Solder Pencil and WMRT Desoldering Tweezers simultaneously. The Weller WR3M Digital Self-Contained 3-Function Rework Station features 400-Watts of power over three independently controlled channels and air and vacuum ports to allow the use of up to three tools simultaneously. The WR3M system is highly customizable with a large selection of rework accessories available. The Weller WR3000M Digital Self-Contained 3-Function Rework Station w/Tools is compatible with the WMRP and WMRT high-speed micro tools. Its 400 watts of power over three independently controlled channels and the air and vacuum ports allow the use of up to three tools simultaneously. The WR3000M includes the new HAP200 200-Watt Hot Air Pencil for efficient lead-free rework and the WRK Desoldering Set allows component removal up to 30 x 30 mm. The Weller WD1M ESD-Safe Micro Digital Rework Power Unit features three buttons for pre-setting frequently used temperature settings and an extensive special functions menu for accessing setback, lockout, temperature window, F/C switching, standby, and auto-off time. With our extensive choice of station/tool matchups you’re sure to find the right combination to meet your needs. For questions or further details please see our contact information below. We're very excited to work with our friends at Apex Tool Group to offer you these money-saving combos on this selection of their quality tool brands. 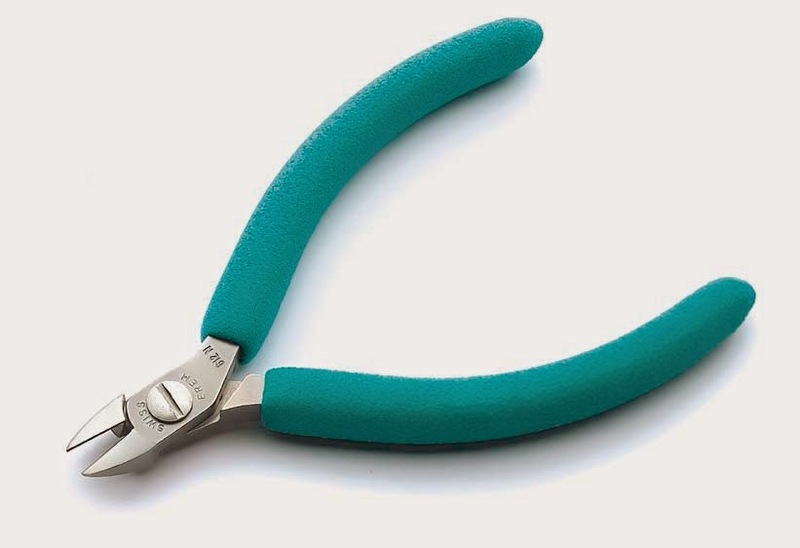 Weller, Erem, and Xcelite have decades of expertise in developing professional quality tools such as soldering and rework stations; tweezers and pliers; and cutters and nutdrivers. Please Note: Our Partner Promo (Version 2) is valid from April 1, 2014 through June 30, 2014. No coupon code is required to receive FREE tool offer. Check out our 30th Anniversary Partner Promo page to make your purchase or contact us via phone (800-966-6020) or email. We'd appreciate it if you would click here to tweet this post and help us spread the word about this exciting promo.